Poker is as popular today as it has ever been and it’s easy to see why. An exciting mixture of psychology, tactics and sheer luck, poker is simple to learn and promises big rewards. Texas Hold’em is undoubtedly the most popular form of poker, and it is usually Hold’em that people are referring to when they talk about poker. If you want to learn how to play poker, then look no further than our simple guide to the rules of Texas Hold’em. Like any form of poker, the object of Texas Hold’em is to make the best possible five card hand from the cards available to you. Whoever achieves this will win all of the money in the pot. In Texas Hold’em, all players initially receive two private cards – or “hole cards” – which remain hidden until the end of the hand, plus five cards in the centre of the table – “community cards” – which all players may use to form their best possible poker hand. Aces are the highest ranked cards in poker, beating kings, queens and so on, with twos (commonly referred to as “deuces”) being the lowest ranked. In the event of a player having an identical five card poker hand, the pot is shared equally. Straight Flush – Any five consecutive cards, all of the same suit. The very best hand in poker is an ace high straight flush, usually called a “Royal Flush”. Four of a Kind – As the name suggests, four of the same card (e.g. kings) with one other. The best possible four of a kind would by four aces, with a king “kicker” (the fifth card in the hand, used to settle a tie). 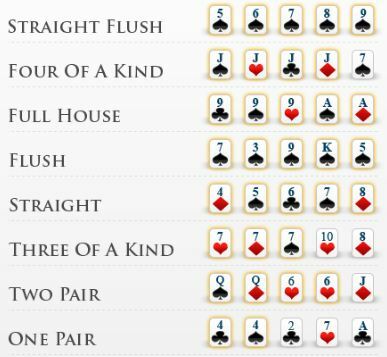 Full House – A full house is three of a kind, plus a pair, for example three tens and two aces. The best possible full house would be three aces with two kings. The most important part is the three of a kind, so “queens full of twos” (Q-Q-Q-2-2) would beat “jacks full of nines” (J-J-J-9-9). If both players have the same three of a kind, then the highest pair is used to decide the winner. Flush – A flush is any five cards of the same suit that aren’t consecutive. A “king high flush” would beat a “queen high flush” and so on, and if both players have the same strength flush, the second, third, fourth and fifth cards are used to break the tie. Straight – Five consecutive cards, such as jack, ten, nine, eight and seven, but all with different suits. Three of a Kind – Often called a “set”, this is simply three cards of the same rank, with two random cards. For example, three fives, a jack and an ace. Two Pair – A fairly self explanatory name, this a hand consisting of two pairs and a random fifth card. Two aces and two threes with a jack would be called “aces and threes”, or “aces up”. The higher of the two pairs is used to decide who wins and if both players have the same highest pair, the second is used. Aces up would beat kings up, while aces and threes would beat aces and twos. One Pair – When a player has two cards of the same rank – such as two queens – but nothing else, this is known as “one pair”. A pair of aces is the best possible pair. High Card – When no other poker hand can be formed, the highest card is used to declare a winner. Ace high beats king high, which beats queen high and so on. So now we understand the ranking of hands, but how does a hand of poker actually unfold? First of all, it’s important to understand that there are three ways to play a poker game like Texas Hold’em – No Limit, Pot Limit and Fixed Limit. In all three betting limits, players are forced to pay a contribution to the pot before seeing their cards, in order to make sure there is something worth winning. Sometimes antes are used, where all players must pay a small amount, but more commonly, Texas Hold’em features “blinds”. The player to the left of the dealer pays the “small blind” and the next player in turn pays double that amount to the pot – the “big blind”. In Fixed Limit, often just referred to as “Limit”, players are only able to bet a fixed amount each time, which is determined by the blinds. If the game is played with £2 / £4 blinds, then the first two betting rounds will be played with increments of £4 and the final two will be in £8 increments. If the stakes are £3 / £6, then the betting limits will be £6 and £12. In Pot Limit Hold’em, players are only able to raise by the amount in the pot at any given time, while in No Limit Hold’em, players can raise as much as they have in front of them, should they so desire. After the cards are dealt and the blinds have been posted, players decide whether to “fold” (throw away their cards and take no further part in the hand), “call” (match the bet, in order to continue playing) or “raise” (increase the amount of money required to continue). Once all of the betting is finished, three community cards are dealt, known as “the flop”. Here, another round of betting takes place. The player to the left of the dealer must decide whether to bet, or to “check” (carry on playing in the hand, without putting more money in to the pot). If all players check, we carry on with the hand, but if a player bets, then the other players must choose whether to call that bet, raise it or fold their hand. After the latest round of betting, we take a fourth community card – the “turn” and have another round of betting, which is just the same as on the flop, before taking a fifth card – called the “river” – and a final round of betting. Once all of the betting is finished, the hands are revealed and the winner takes the pot. If all players fold at any point in the poker hand, then the last player remaining takes the pot without even having to show their hand. There are two ways to play poker – “ring games” and “tournaments”. In a tournament, all players pay a fixed fee to enter, in return for a fixed number of chips. When a player loses their chips they are eliminated from the tournament and whoever has all of the chips at the end is declared the winner and will receive their share of the prize pool. In a ring game, or “cash game”, the chips at the table represent real money and if a player loses them, they may buy more with which to continue playing. 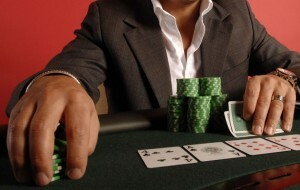 A player may leave the game at any time and exchange their chips for real money. Now that you know how to play poker, why not dip your toe into the water and get involved in a game? With so much choice in terms of online poker, you can play from the comfort of your own living room and you certainly don’t need to waste time driving to your local casino. A great place to learn the game of Texas Hold’em is Carbon Poker, as the games are relatively easy to beat. Better poker players tend to play at bigger sites, so a smaller site like Carbon is ideal for a poker beginner, and the site is one of the few poker sites that accept US based players.